The free core WP RSS Aggregator plugin can be used alone, or in conjunction with any of our premium add-ons. The plugin can be installed in one of two ways. Below are step-by-step instructions together with videos to explain both methods. From the search box on the top right, search for the words "WP RSS Aggregator". Once the plugin has installed, the same button will change to say Activate. Click to activate the plugin. Congratulations, the plugin is installed and ready to use! You will now find a new dashboard menu item called RSS Aggregator, from where you can start using the plugin. 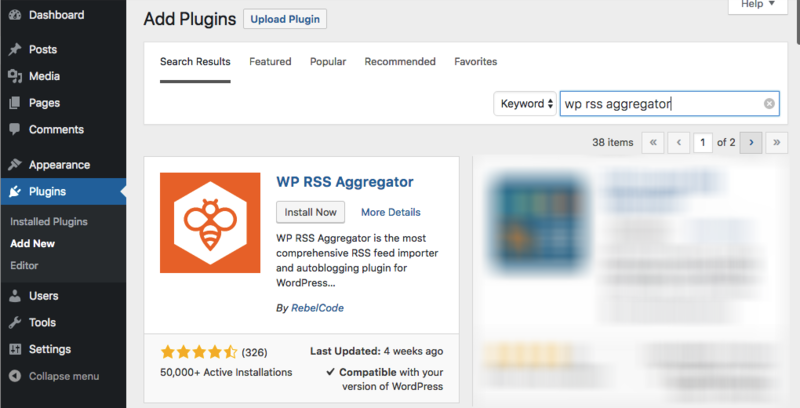 Visit the WordPress Plugin Repo and search for WP RSS Aggregator. Click on the blue Download button on the right-hand side and save the plugin to your Desktop. Once the plugin has downloaded, do not unzip the folder. Now, visit the Plugins page of your WordPress site's dashboard. Locate and choose the zip file you just downloaded. It will be titled wp-rss-aggregator followed by the version number.